My name is Manuela Julien; I am a speech and language therapist, clinical linguist and also language teacher (of Portuguese, my mother tongue). I have a particular interest in sociolinguistics and in cognitive processes which play a role in language acquisition in multilinguals. After I finished my PhD at Radboud University Nijmegen, I am now employed as a clinical linguist at the Pento Audiologisch Centrum, at Ede, The Netherlands. Before my PhD research project, I worked at the ‘Audiologisch Centrum The Hague’, a centre for the diagnostics of hearing, speech and language impairments. For my own small entreprise, Clínica Babilónica, I offer courses, workshops, in-company training on the subject of multilingualism and society, language impairments, cultural aspects, etc.. Together with a colleague, I offer an annual two-day course in diagnosis and treatment of language problems in multilingual children, mostly directed at speech and language therapists. 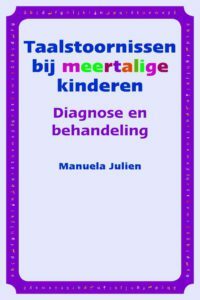 The idea for this internet site arose when I was writing my book `Taalstoornissen bij meertalige kinderen. Diagnose en behandeling’ (Language impairments in multilingual children. Diagnosis and therapy (published by Pearson Assessment and Information). The appendices in the manuscript had to be shortened considerably. Because I wanted to share the information on those appendices with the readers I make them available by means of this Internet site. I hope that this can help them in the daily work with multilingual children with language problems. The information in the book and on this s ite have been inspired by years of experience working with children with language impairments and with normally developing multilingual children. Language is a fundamental and powerfully human cognitive capacity which develops during our entire life within the context of social interaction. There are however children who for one reason or other have difficulties in developing this essential human characteristic. These children, therefore, have a language impairment. The causes behind this phenomenon are several. Communication with the people around the child and the development at school can be obstructed because of this. Fortunately several disciplines work together to help children with language problems. When children with language acquisition problems speak more than one language, the question is frequently put whether that is problematic for such a child. The issue is debated not only by concerned parents, but by professionals too. The aim of my book and of this site is to help build a bridge between the available theoretical and scientific information and the practical situations in which professionals such as speech and language therapists and clinical linguists are faced with on a daily basis. From my own experience I know that it is not simple to apply theoretical information in the complex daily work with multilingual children. The people of Babylon build a tower to the heavens. God considered this a touch too haughty and let them suddenly all talk a different language. 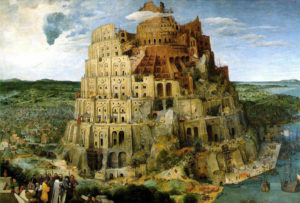 The ensuing Babylonian speech confusion meant that the construction workers could no longer communicate with each other and never finished the tower. All those people must have been seriously worried and have certainly visited their medical doctor at the local Babylonian hospital, or, in Portuguese, the ‘Clínica Babilónica’. The virtual Clínica Babilónica is specialised in providing information related to multilingualism and to diagnosing and treating multilingual children with communication problems.